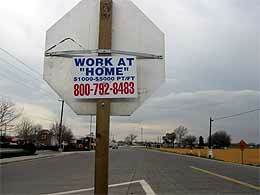 There are about 23,958 of these "Work from Home" signs in Sacramento. That is an exaggeration, but they really are everywhere. 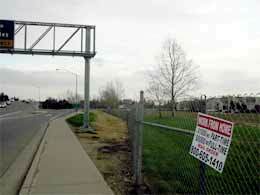 They are nailed to telephone poles and zip-tied to chain-link fences. There are new designs all the time. All of them have a mysterious lack of information regarding what company or scheme they are promoting. 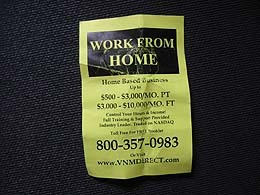 I was always sure they were promoting a scam, I mean, people with a real money-making opportunity don't have to post it on telephone poles. They guard it with encrypted emails, copyrights and lawyers. I never bothered calling the numbers, although I was curious. When I was working at MCI back in 1998, I learned that all toll-free numbers reveal your phone number when you call them, so I didn't want to call from my home phone. While taking photos for the "Why would anyone want to visit Sacramento" article, I was spending a lot of time driving around taking photos. I tore down a bunch of these signs, but it seemed like a hopeless endeavor...there were hundreds of them, and they've been around for years. Finally, one night on Yahoo Messenger, my friend Ross suggested that I do some investigation and report on what I find. He accepted my paranoia about my phone number and suggested that I use a pay phone & track down what they were all about. I wasn't too excited about it, after all, I was sure it was a scam. The very next day, I wrote down seven of the toll-free phone numbers and called them. The first one was 800-326-2016. I was sure I would just be listening to message-machines, so I wasn't nervous about calling. The first one was a message about how mail order is the best business in the world, how it wasn't a "get-rich-quick scheme", and about how they "need help in their business". It asked me to leave my address at the tone, so they could send me a 14-page report. The message didn't say what the company was...just that it was a Fortune 500 company, described as the "fastest growing company in the industry". Alright, well, I hung up without leaving a message. Then I called the next three numbers. They all had the SAME message. It was a woman's voice, and she started the message with a distinctive "Ya know". In the upcoming days of phone number investigation, I heard this message dozens of times. The next one was a wrong number, the sixth number was the "ya know" message. The seventh number had a different message, but it had some aspects of the first message, "20-year industry leader" and "tap into mail-order". This message, too, was an effort to send me a 14-page booklet. Well. I was stunned. These signs were all over town, in scores of different designs, and they were all the work of one company. A super-secret Fortune 500 company that never put its name on its ugly ever-present signs. I walked down to the mini-mart with my head spinning. 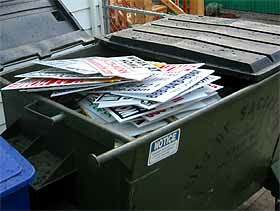 All of these signs...all of this trash...all over Sacramento. One company was responsible. I had to track them down. Also, I had to get photos of the offending signs & start keeping track of the numbers so I could build a convincing case and find the whole story. Maybe my sign-sample just happened to have one source. On the way back from the mini-mart, I found a little one of these dumb mini-fliers taped to a news stand. 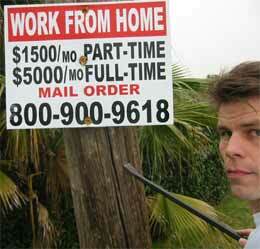 It had the tell-tale figures of my mystery company, $500-$3,000/mo pt, $3,000-$10,000/mo ft. I immediately knew...it was the same people. It was exciting... I was almost scared. This company obviously had lots of people working in all sorts of ways trying to recruit new people into the business. I figured it must be a multi-level marketing company, like Amway, but I wasn't sure what the company was yet. The next day I woke up early and took more photo of signs, making note of the phone numbers. This isn't hard in Sacramento...they are all over the place. I found about 15 varieties in West Sacramento and Downtown. I also photographed bunch of "lose weight now" and "I lost 30lbs. in 30 days" signs, and one "Sal's Tacos" sign.